This is such a bittersweet review to write. One the one hand, the book was amazing. Everything I wanted, could have asked for, and more. But it’s the last of the series, and I almost didn’t want to read it, just so I could make the series last. Elisa is on the run. Not only is she a fugitive in her own country, but her enemies have taken the man she loves to lure her to them. Her Godstone is more alive than ever and she knows she still has more to accomplish. She is driven and determined to not fail the man she loves, her country, her friends, and herself. Every choice she makes is important and the pressure she is under is immense. Elisa is amazing in The Bitter Kingdom. She doesn’t let worry or fear cloud her judgment. She knows she faces many problems, but instead of losing control, she decides what to do and when. She uses her voice powerfully and doesn’t back down when she knows she’s right. There is so much she accomplishes in this novel. There is also a glimpse into Hector’s mind in The Bitter Kingdom. They don’t take up a large section of the novel, but they are enough. They show the respect and admiration he has for Elisa as well as the love he has for her. They carry so much weight in so few pages, but they give you such a good, warm feeling. As for the romance between Elisa and Hector, Carson isn’t building it up as much in this novel, but instead focuses on showing how Hector and Elisa are equals, and how their love built on friendship, trust, and admiration is a guiding force for each of them. The storyline just about did me in. I couldn’t stop reading, deciding sleep wasn’t necessary and that caffeine loading the next day would be completely worth it. I just had to know what was going to happen next. There was no easy spot to stop and say “here is good, I’ll pick it up here tomorrow.” I even had trouble stopping to make myself lunch and dinner. The action and fighting was intense, and even the times when there wasn’t fighting, I still couldn’t put the book down. 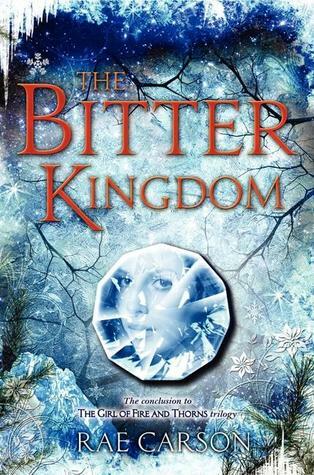 The Bitter Kingdom is one of the best series ending novels I’ve read. It has a little bi of everything and is incredibly well written. I’m extremely sad to see this series end, but it ended perfectly. I cannot wait to see what Carson comes up with next. Some books are so good that when you reach the last chapter, after every line, you look away and say “I just can’t handle this. I can’t, I can’t, I can’t.” The Crown of Embers is one of those books. Elisa grew up so much in The Girl of Fire and Thorns, that I wasn’t sure there would be any room left for her to grow. I was so wrong. She still doesn’t have the strength she needs to rule a country. She’s not that sure of her own power yet. Despite her best efforts, she’s able to be manipulated and the glory of her victory in war is starting to fade. She’s not weak, however. She is willing to do whatever she needs to save her country and its people, and she’s definitely not stupid about how she fights her battles. The romance in this one had me feelings like a giant puddle of goo. Her love with Humberto was sweet, and it’s a love she’ll never forget. First loves are like that. I’ll even admit to spending the first couple chapters just wishing Humberto would make a surprise appearance. But then, something wonderful happened and now I’m even more in love with Elisa’s romance. It’s built upon trust and respect and it’s so, so, so amazing. Once again, Carson is able to build Elisa’s wonder fantastically. Every location is beautifully described, jumping off the page and coming to life. The Crown of Embers is one of my favorite books of the year. It’s filled with everything I love and nothing I don’t. Carson writes the story I didn’t even realize I wanted and she does it so perfectly that there really isn’t anything I can say against it. The Crown of Embers is a book that deserves to be read and I really can’t wait for The Bitter Kingdom.